Women’s Croft & Barrow Classic Quilted Vests Just $12.74! You are here: Home / Great Deals / Black Friday Deals / Women’s Croft & Barrow Classic Quilted Vests Just $12.74! 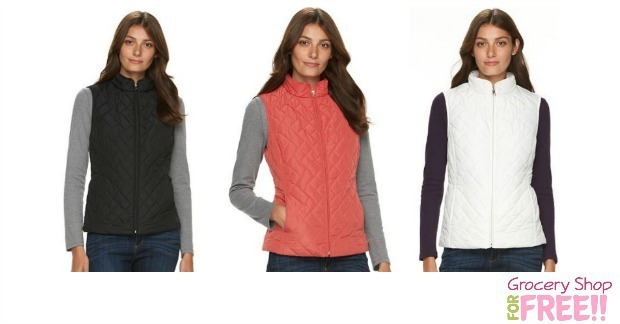 Check out these Women’s Croft & Barrow Classic Quilted Vests (in a variety of colors & prints)! They are are marked down to just $14.99 right now and they are regularly $44! But, WAIT! There’s more! 🙂 You can get an extra 15% off all purchases when you use code: NOVSAVE15 at checkout! That makes them just $12.74 each! These would make great gifts! If you order a few you can get shipping FREE on orders of $50 or more! Or just choose FREE in-store pickup! Plus, you’ll earn $15 back in Kohl’s cash for spending $50!